One of the tools day traders use to make their trading decisions is various types of market data, commonly referred to as Level I and Level II market data. This market data includes information about current prices and recently completed trades. Level II data provides more information than Level I. Traders decide which data feed they require for their trading, and then subscribe to that data feed through their broker. Depending on the broker, Level I and Level II may have different costs associated with them. It's important to be aware of the differences in data feeds, so you aren't paying for something you don't need. Bid price: The highest posted price someone is willing to buy an asset at. Bid size: The number of shares, forex lots or contracts that people are trying to buy at the bid price. Ask price: The lowest posted price someone is willing to sell an asset at. Also called the "offer price." Ask size: The number of shares, forex lots or contracts being sold at the ask price. Last price: The price at which the last transaction occurred. Last size: The number of shares, forex lots or contracts involved in the last transaction. 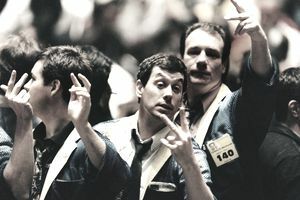 Scalpers, or traders who trade based on changes in how other traders are bidding and offering, use Level II data, which provides multiple levels of bids and offers. Level II provides more information than Level I data. Mainly, it doesn't just show the highest bid and offer, but also shows bids and offers at other prices. Highest bid prices: Shows the highest five to 15 prices where traders are willing to buy an asset, and have placed an order to do so. This means you not only see the current bid, but also all the bids currently below it. In actively traded stocks, there will typically be bids every $0.01 below the current bid, and in actively traded futures, there will typically be a bid each tick below the current bid. If there is a gap between the current bid and next bid, that typically means the stock or contract may have a larger bid/ask spread than stocks with bids or offers at every visible price level. Bid sizes: The number of shares, forex lots or contracts that people are trying to buy at each of the bid prices. Lowest ask prices: The lowest five to 15 prices where traders are willing to sell an asset, and have placed an order to do so. In actively traded stocks there are typically offers every $0.01 above the current ask, and in actively traded futures, there are offers each tick above the current ask. Ask sizes: The number of shares, forex lots or contracts that are available at each of the ask prices. Level II market data provides the additional information needed to trade based on changes that occur in the bids and offers. Some traders like to look at how many shares are being bid versus how many are being offered, which may indicate which side is more eager or more powerful, and may predict the short-term direction of the market price. This tactic is combined with watching the recent transactions. If most of the transactions are occurring at the bid price, it means the price could go down in the short term, whereas if most of the transactions are occurring at the offer the price could go up. These methods may also be combined with chart-based strategies. Level II is also known as the order book, because it shows all of the orders that have been placed and are waiting to be filled. An order is filled when someone else is willing to transact with someone else at the same price. Level II is also known as market depth, because it shows the number of contracts available at each of the bid and ask prices. Market data comes from the exchange that offers the market. For example, the New York Stock Exchange (NYSE) provides Level I and II data for stocks listed on the NYSE. Day traders receive the market data via their day-trading brokerage. Level I and II is available for futures and stocks. Some forex brokers also offer Level II market data, although not all. Level II costs more than Level I for stocks and futures. Some brokers may provide all the data feeds for free, but typically charge higher commissions to compensate. Forex brokers that provide Level II data usually don't charge for it. What Does Fungible Mean in Trading? What Is the Difference Between a Long Trade and a Short Trade? What Do Long, Short, Bullish. and Bearish Mean?